Tina is a hard-working 19-year old trying to raise a newborn, make a home with her fiance, and get a degree studying special and elementary education. Her fiance is working on his college degree as well. Tina loves kids and has been using Care.com to find jobs working with children. “I have a newborn son and my fiancé and I now have an apartment, so of course we have bills to pay. I was looking hard for a job and came across a woman wanting a babysitter. She said she lived out of the state (Ohio) but was relocating here soon due to her job which she also told me she was self-employed. When her English was bad, I kinda brushed it off, but when she kept pushing for me to let her know when the check has deposited in my account and making sure I had a working back account, I became suspicious. Plus, who would send ANYBODY they don’t know $3800?! At first it was $2,775 then it increases another $1,000? I knew something was off. 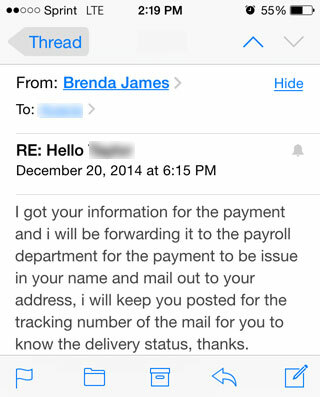 She, he… whoever, also sent me the tracking information and it came from Puerto Rico & the check was from Survey Savvy. Another [red] flag. 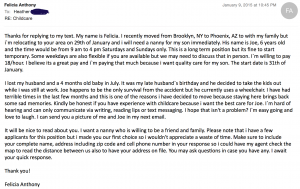 I continued to email her, asking for her son’s name, to make sure her story would match up, and also told her that I am on my way to deposit the check. Still waiting for a response”. Tina replied saying that she was clear on Brenda’s instructions and told Brenda where she banked, adding that it shouldn’t be a problem to deposit the check quickly for Brenda. It was never made clear to Tina who the check was coming from and why some company was sending a check if Brenda was self-employed. Several days went by that Tina did not hear from Brenda so she contacted her to see if all was still OK. Though Tina is only nineteen years old, she’s savvy enough to conclude that some things didn’t seem to add up. The more she thought about some stranger with whom she had only exchanged emails sending her a check for $3800, the more suspicious she became. And then the check arrived via a FedEx envelope (not the United States Postal Service). Can you spot any “red” flags by looking at the check or the FedEx envelope images that should make Tina even more suspicious? Tina’s suspicions led her to use Google to try to figure out whether or not this was a scam. That’s how she found our Care.com Nanny scam story at TheDailyScam.com. Red flag: Tina noticed that the check she received was from a company in California that she had never heard about in her conversations with Brenda. Red flag: It continued to bother Tina why anyone would trust her, a complete stranger, with a check for $3800. 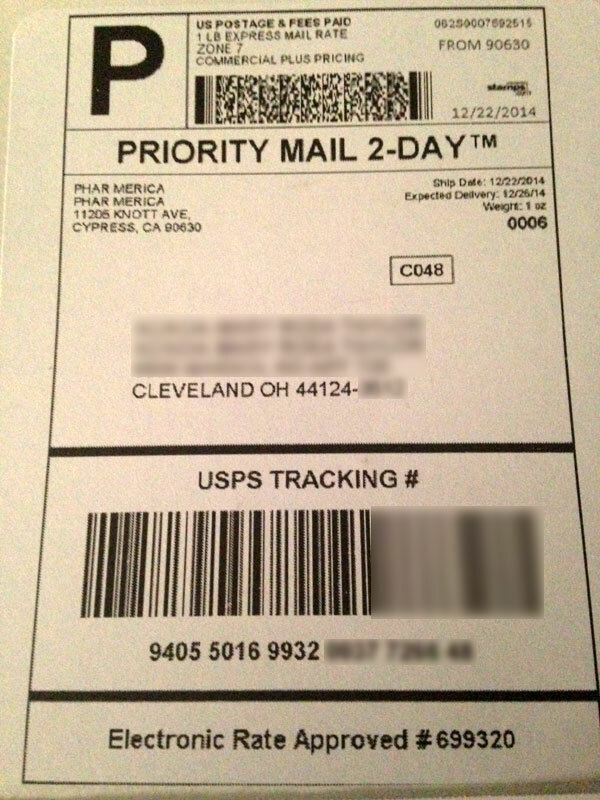 Red flag: The FedEx label said that the check was shipped from PharMerica in Cypress, CA. PharMerica is a long term Pharmacy care service with offices all over California, including San Diego, and other states. However, Brenda never mentioned PharMerica to Tina and PharMerica has nothing to do with Survey Savvy. While we were speaking to Luth Research, another call came in from victim number eighteen, a college student named Melanie from Pennsylvania. With Melanie’s permission, the employee at Luth Research gave us her contact information and we spoke to her little while later. Melanie’s story is similar to Tina’s and that of many young adults who have used Care.com to try to find work as a nanny or care-giver. It is important to say that Care.com is not responsible in any way for the fraud that is being perpetrated using their website. We’re certain they would want to stop it if they could. Melanie is a 21-year old college student who has successfully used Care.com to find nanny jobs taking care of children. She told us that she has never had a worry using Care.com to find work, until just recently. She was contacted by a couple claiming to be living in England, but who would soon be moving to the United States. The couple, Linda and Calvin Davis, were to be accompanied by Linda’s wheelchair-bound mother and needed Melanie to help set up their home in advance. Melanie was to be hired to purchase household items, a new wheelchair and groceries, and she would be paid for her time in addition to the items she purchased on their behalf. The Davis’ were supposed to arrive on Dec 28th. However, Melanie told them that she wouldn’t cash any check until they met face-to-face on December 29th. According to Melanie, that’s when the Davis’ started to delay and pressure her to cash the check that had already been sent. The Davis’ response was to say “so sorry” but plans have been changed and they would arrive a few days later. They insisted that Melanie go ahead and deposit the check. 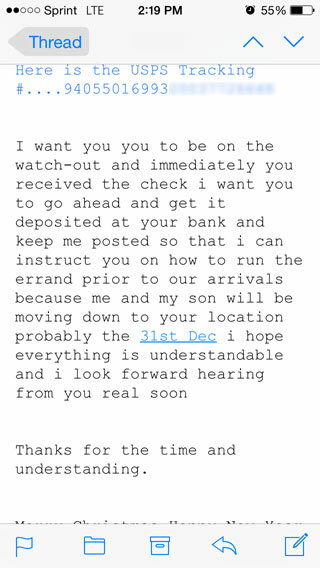 This made Melanie very suspicious and she told them that she wouldn’t deposit any money until they met in person. The Davis’ responded with yet another reason for a delay. This time until Jan 5th. Without waiting for an OK from Melanie, the Davis’ informed her that a check was on it’s way to her and she should deposit it. Melanie now realizes that her instincts were correct and has now cut off contact with the “Davis’” This scam that targeted Melanie was just another variation of the scam that targeted Tina. a) Suddenly announces that all plans have fallen through and asks the victim to wire the money back via Western Union or some other anonymous means. It’s OK, afterall, since the victim had already deposited the money, right? What the victim doesn’t realize is that these checks can take a week or more before they bounce because each check contains some factual information such as the correct bank routing number and bank account name. TDS spoke to one bank who informed us that the fake check had the correct name of an account holder and correct routing number but the bank account number on the check belonged to a different account holder at the bank. These things serve to delay the check from bouncing giving the scammer time to pressure the victim to return the money. b) The scammer writes a check for more than the arranged amount and asks the victim to wire the difference back before the victim discovers that the check bounces. 1. The scammer creates a story in which he or she is in a very different geographical location than the victim, but is planning to move to the victim’s location.2. 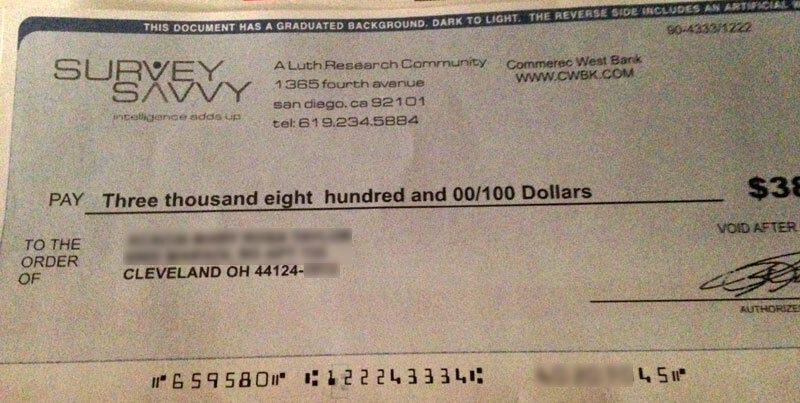 The scammer creates a reason for sending the victim a large check, but not too large. They generally seem to be in the range of about $2000 – $4000 dollars. The checks can’t be too large so that the victim doesn’t likely have enough money to send to the scammer.3. 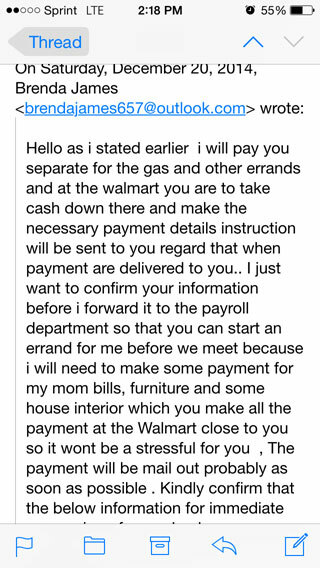 In each case so far the scammer is either deaf or very hard of hearing. This creates the pretense that the victim cannot speak with the scammer on the phone or via Facetime or Skype. This pretense forces all communication to be through email, or possibly texting. Sometimes the scammer is on another continent and so a phone call is too costly or difficult to arrange. Fortunately, both Tina and Melanie escaped without any financial loss. But both women were appalled to learn that they were nearly victimized and embarassed by how much personal information they turned over to the scammers. TheDailyScam urges readers to spead the news about these types of scams, especially to young adults who are most vulnerable and a bit naïve as they search for work taking care of other people’s children. We also urge readers to keep a healthy dose of skepticism when using the Internet, especially if anyone tells you that they will pay you money in advance. https://www.facebook.com/Facecrooks/posts/10152132002278965 –A Facebook user reported that someone named Brenda James tried to push a fake Facebook lottery scam. 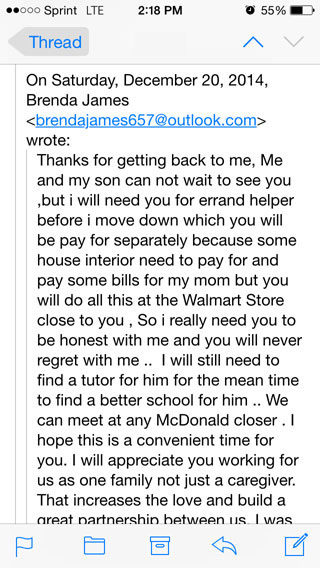 Hello, thank you for responding to my text…Its my break time and i want to use the opportunity to email you, I live in Hollywood, Florida, but i am moving to your area on 21st of December and i will need a babysitter for my 6 yrs old Son or house keeper immediately, Depend on what time you will be available for him or the house keeping position and hrs if i am okay by it and i will also need you for an errand to help my mom pay her bills, do some shopping for my mom and son and pay for the furniture for my new house as started in my text. Please let me know if you also work on weekend and make sure you let me know when its convenience for you. More importantly, I am willing to pay you just try and get back to me and let me know how much you want for the childcare or house keeping and the errand helper, which i will pay you separately and handsomely for the errand because i will need to get some thing fix before i move down, like the furniture bills, mom bills and some little stuff. I really need a honest and responsible person. This could be a temporary/permanent job. It depends on what your schedule looks like but i do like to be sure if you are available the first month. I am moving to a new house that i need to fix some interior and get furniture and have contacted the furniture company because i don’t know if you will like to stay in my house or you want my son to stay with you that really depend on what you want. I will let you know as soon as we finalize issues. I will like you to send me your complete name, address and cell phone number so i can include that to my payroll for the period. I also will like you to tell me a few things about yourself. Here is a little about me. I am a single mother, I am 39 and i am hard of hearing. I have lived in Clayton, North Carolina before. I attended North Carolina School for the Deaf because i am hard hearing, where i achieved my highest qualification. I have my own business (Self Employed). I am never married. I attend the catholic. You will get to know more when we meet. Kindly include in your email your complete name, address and also your cell phone number so i can text you in case i need to pass an urgent information. 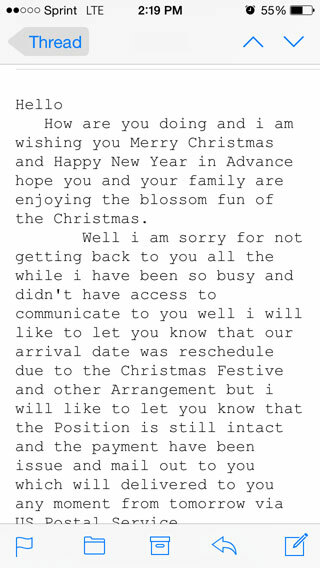 UPDATE: On January 9 TDS received information from yet another young woman who might have been victimized by these scams. Luckily she found our article and knew immediately that the email she received was a scam. 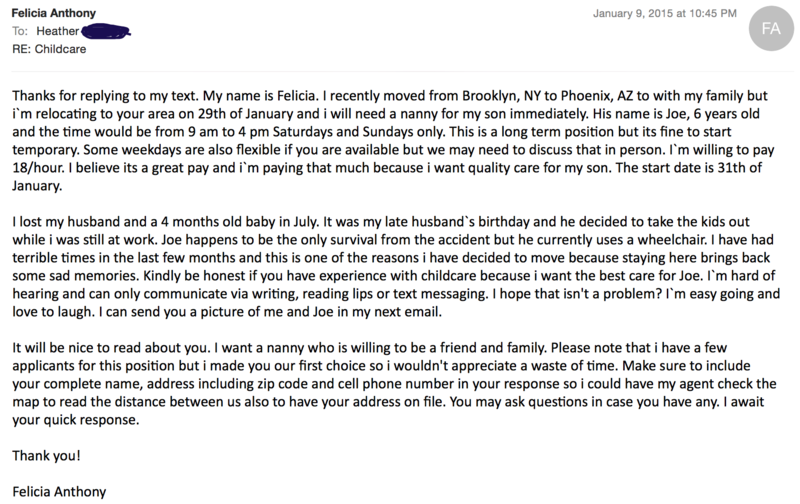 Check it out:Hello, I recently received a text from a woman named Felicia seeking childcare. I responded thinking it was most likely something fishy but I wanted to see what her response would be. There’s obvious red flags so I Googled her name and care.com scams. nothing came up under her name but I found an article on your site about other people being scammed and my email is almost identical. Care.com suggests that caregivers print out the email & take it to the police station but I don’t think that will do anything. I thought I’d send you guys a screenshot of my email & help spread the word. I’ll be going to my police station tomorrow anyways :/ Thanks for saving my ***.